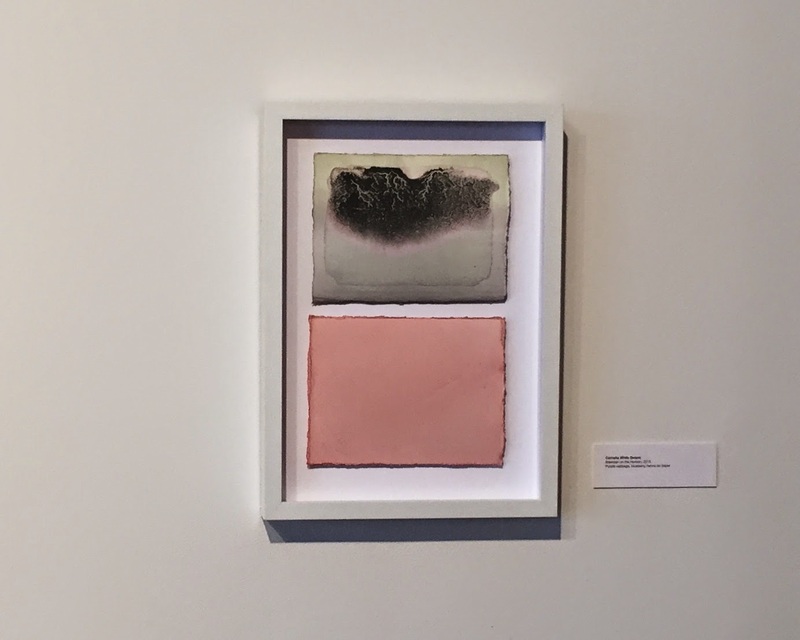 In her new series of works on paper, Cornelia White Swann explores the use of natural pigments and reflects on how that process challenged the way she was accustomed to working and how she accepted the evolution of the work before her. Swann has previously worked with synthetic material that was permanent, archival and that was meant to maintain its color over time. Light-fastness is a very important consideration for artists, and as Swann noticed how the naturally derived pigments she was working with changed over time, this unnerved her. However, she realized that for this series she needed to let go of that desire for permanence and instead, “accept the process…[and] the fugitive nature of this color.” This realization led to the work that is on display in this exhibition, as she let the process and the materials guide her creating. These intimate works on paper are Swann’s initial explorations into working with the pigments she hand-made from fruits, vegetables, flowers, plants, and herbs. The varying shades of color flood the paper with the surprisingly golden hues derived from red onions, or the greenish tone produced by red cabbage. There were also lovely shades of magenta and bluish-violet from hibiscus, pinkish coral from henna, and bluish-grey from elderberry. Visually reminiscent of color field paintings, like those by Mark Rothko or Helen Frankenthaler, these pieces have a serene and meditative quality. Also included in this exhibition is a group of solar dyeing jars each filled with water, a plant or herb, and a rolled up sheet of paper. These jars will be exposed to the sun for a period of time, and the natural dye will adhere to the submerged sheet of paper. The end result will depend on the length of time and the type of natural pigment used. Some of the works that derived from this process are on display and are particularly striking. The resulting monochromatic layers are reminiscent of eerie landscapes. Swann plans to document the natural evolution of these works and how they change over time, with a follow up exhibition planned for 2016. Fugitive Color I is on view through April 25, 2015 at French and Michigan.